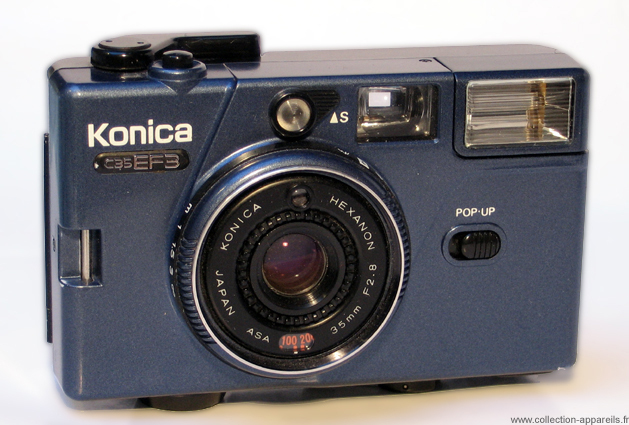 The C35 EF3 was hailed during its presentation to the Photokina of 1980, for its refreshing aspect. Indeed, it was launched simultaneously in three colours: red, blue and ... black. Some manufacturers had dared colour, but not supplying a complete camera range from the launch. The C35 EF3 is a modernization of C35 EF. It is also smaller than its predecessor. Its lens Hexanon 2.8 / 35mm with 5 elements in 4 groups doesn’t benefit the AF. The focus is done manually, from 1m to infinity, with symbols. The exposure is metered by a CDs cell. The programmed electronic shutter allows shutter speeds from 1/60 to 1/500 sec. A LED in the viewfinder shows the under-exposure. The "pop-up" button is used to eject the flash, which is switched on. The LED located above the lens is the one for the self-timer. Other colours were added during the span life of this camera: white, gold.